As you all should know, the minecraft world is seperated into chunks. 16×16 areas that are loaded depending on how close a player is to them. If you have machines or plants or anything that does something in a chunk that is not loaded because there are no players nearby nothing will happen. 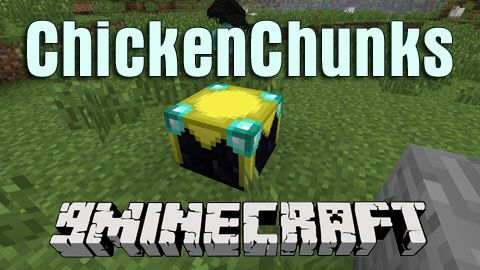 ChickenChunks Mod adds a block called a chunkloader, when placed it will keep chunks around it loaded even if no players are nearby or even online. So now your plants can grow and your automatic quarries can run, even when you’re not around. So you’ve seen a few of these things around before, Teleport Pipes has one, Railcraft has two. Immibis has one. Here’s a short feature list. 100% not buggy guarantee (I’ll fix it if you find a bug). External viewer for seeing the loaded chunks and making sure everything works. 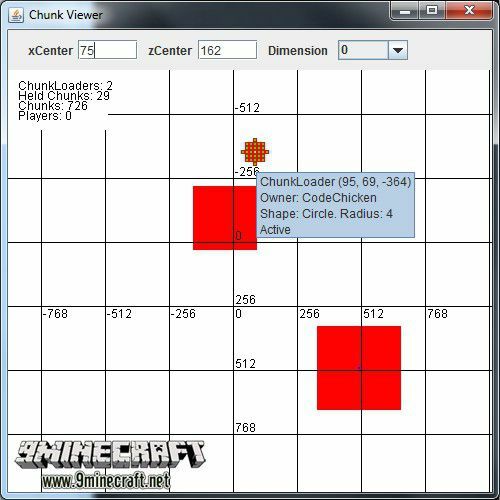 Server owners can set the number of loaded chunks per player, per dimenion and globally. Will load and unload mystcraft dimensions as needed. Server Operators can set them to only work when a player is online. Simply place the chunkloader down and open up the Gui. It now belongs to the person who placed it and chunks that it loads will count towards their limit. You can only open the Gui if you own the chunkloader. The radius determines the number of chunks to load around this one inclusive. The shape is either Circle, Square, LineX or LineZ all of which are self explanitory. A radius 3 with square will load a 25×25 chunk area. The number of chunks loaded is shown below the radius. The total number of chunks you have loaded out of the amount the server has allowed you is shown at the bottom. The show lasers button will show some spinning lasers that border on the loaded chunks for easily seeing if your blocks are in the loaded area. Using the command /chunkloaders will activate the ChunkVeiwer if the server has allowed you to. It will be centered on the player in the current dimension when first activated. You can move it around by dragging it with the mouse. The Red blocks are loaded chunks. The Yellow blocks are chunkloaders. The Blue blocks are players. In the top left the number of ChunkLoaders, Held Chunks (by Chunkloaders), Loaded Chunks and Players in this dimension are shown. The numbers on the axis are the coordinates in blocks. The Horizontal is the x axis and vertical is the z axis. Mousing over a chunkloader or player will show info about it as a tooltip. You can see three sets of chunks, one around the player, one around the spawn point and some around a chunkloader. The Gui will close if you leave the server. 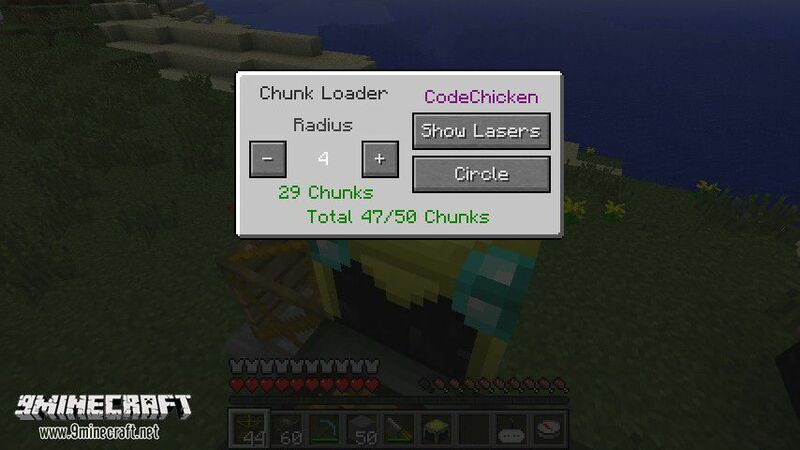 The server operator can set the number of chunks per player, per dimension and overall that are allowed to be force loaded. The server can also add player names to a list to have chunkloaders only work when the player is online. There is also an option to disable the automatic world loading for mystcraft dimensions if you don’t want them to be hogging your processor/diskIO after a reboot.